HÀ NỘI — Pandemonium rules. Hundreds of people are running out a building, screaming in terror. Several have their mouths covered with piece of cloth. Ear-splitting sirens blare as large red trucks speed through the streets to where a thick, ominous cloud of smoke billows. Even watchers are shouting and screaming. A deadly fire has struck again. It’s a scene right out of a blockbuster movie, but one that occurs far too often in real life. On November 21, 2016, two adjoining houses on Trần Khát Chân Street in Hà Nội caught on fire, everything inside was destroyed, one person burned to death. Eight days later, flames engulfed a swimming pool on the fourth floor of a supermarket right next to Xa La apartment building in Hà Nội’s Hà Đông District. No one was hurt, luckily. Last April, residents of the Linh Đàm apartment building in Hà Nội escaped with their lives, but dozens of bikes, motorbikes were razed, windows shattered by a flame that started on the first floor, a parking area, and grew into a big blaze. These were the lucky stories. But not all of them was as lucky as those. A family of six members perished in a fire in Cà Mau City on July 31 when they could not find their way out of a fire that broke out from a wooden house located behind theirs. 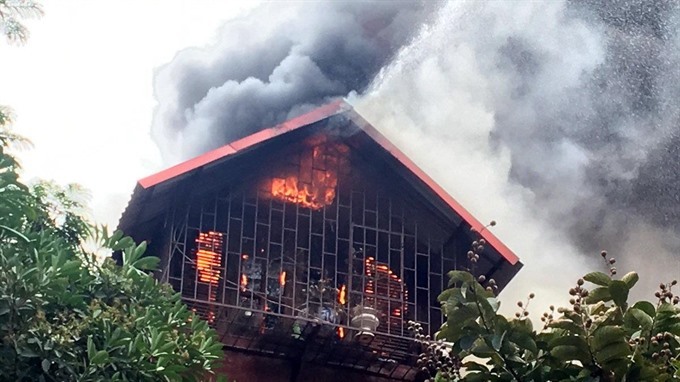 On December 16, six members of other family, including three children one to seven years old, died when a fire broke out at a two-storeyed house in HCM City. According to the Department of Fire Prevention and Control, Rescue and Salvage under the Ministry of Public Security, there were 3,006 fires in 2016, a sharp rise over the 2,792 recorded the previous year. A total of 98 people died. The fires broke out in warehouses, factories and other sites, but the largest proportion, strikingly, were in residential buildings, at 1,290 cases (about 42.9 per cent). Another factor to note was that it was not just old, degraded buildings that were more prone to fires. Several new, modern buildings were also hit. Statistics also show that a relatively large number of fire accidents were caused by human error, including the burning of incense and votive papers. Four young men in HCM City’s Phú Nhuận District perished on December 6 while using “perfumed petrol,” Isopentyl Acetate or banana oil, to clean their house. The flames broke out when they flicked a lighter to light a cigarette. 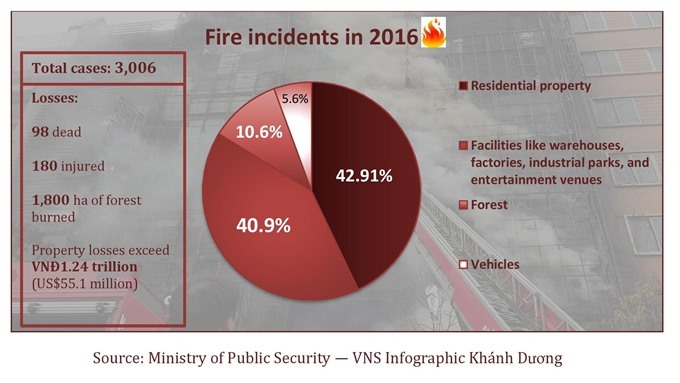 Lieutenant Colonel Bùi Quang Việt, deputy head of Department of Fire Prevention and Control, Rescue and Salvage, told Việt Nam News that many residents tended to overlook fire safety precautions. A majority of residents lack fire escape skills. They don’t know what they should do first in case of fire or explosions. The calling of fire and rescue services is not ingrained into their response, so when the forces do arrive, the blaze has spread wide and become far more difficult to contain. Violations in installing and operating fire equipment are among other problems. 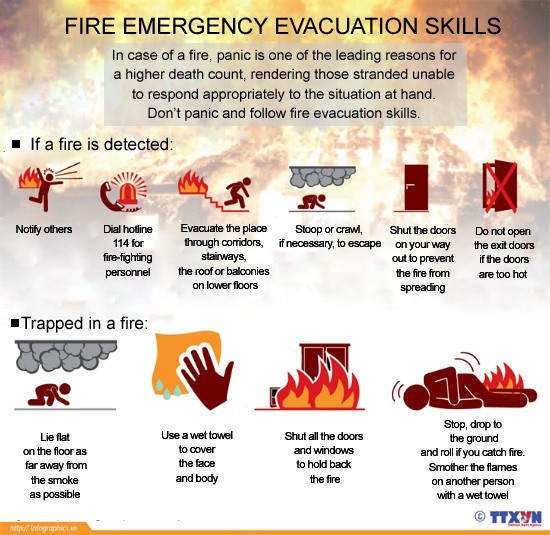 It has been seen that the use of fire prevention equipment is quite effective when fires break out. However, most residential houses are not equipped with fire alarms and other equipment, Việt said. Most apartment buildings of 20 years plus were built with little regard to fire protection. The requirements were quite lax before, and only basic items like fire extinguishers and fire protection notices are found, said engineer Nguyễn Linh Quang. Even at new, modern apartment buildings in big cities equipped with fire alarm systems, these may not really work when fires do happen. At the Rainbow Linh Đàm Apartment fire, residents told media that they did not hear any alarm ringing. Had it not been for the calls from neighbour residents living in the opposite tower who saw the blaze and warned them, they would have not woken up in time. In another fire at the HQC Plaza apartment building in Bình Chánh District, HCM City last July, fire alarm systems had yet to be checked because the building was still under construction. The investor allowed apartment buyers to move into the building before construction was complete. “We must take into account the irresponsibility of investors and management boards of apartment buildings,” said Lieutenant Colonel Bùi Quang Việt. Engineer Quang felt that occasional malfunctioning of fire fighting system is due to “Việt Nam’s typical climate of high humidity and high temperatures, which might trigger some overly sensitive sensors, leading to false alarms. In buildings where false alarms occur frequently, the fire alarms may be deactivated then forgotten about, or the residents and guards may develop ‘alarm fatigue’ and start to willfully ignore the fire alarms, assuming it’s another false one. “Fire fighting systems must be periodically maintained and tested in dry runs, especially in fire drills – an activity that should be organised once a year. Only then can we ensure that the system functions properly in emergencies," Quang added. “Lacking a water source to extinguish fires, not keeping a safe distance between houses, houses being located in narrow alleys, and traffic congestion during rush hours preventing fire engines from reaching a scene in the shortest possible time are all challenges that we face,” said Lieutenant Colonel Việt. Alex Kennedy of Los Angeles, an expat in Việt Nam, said the problem does not seem to be a lack of fire safety regulations, but flawed implementation. In Los Angeles, when someone wants to start a construction, they have to obtain numerous licences. Local authorities pay frequent visits to the construction site to check up if there is any danger to the house itself and nearby houses. Kennedy said regulations are strictly enforced in LA and bribery of officials to overlook lapses, if any, is heavily sanctioned on discovery. Fire safety officials frequently visit to check whether regulations are observed – often to the vexation of residents, but they also know these help minimise the risk of fire. During his four-year-plus stay in Việt Nam, Kennedy also noticed that very few people have the habit of hiring lawyers to deal with legal procedures, to sue buildings’ investors should something go wrong. Thus, unscrupulous and profits-first investors are able to flout fire safety regulations without much consequence. He felt a change in local people’s mindset was needed to address fire safety problems in Việt Nam. The largest proportion of fires that broke out last year were in residential buildings. In new, modern apartment buildings, apart from improved fire protection systems, other measures are being taken. Đàm Thị Xuyên, head of the residents’ association at T23 Tower in Hà Nội’s Vinhomes Times City urban complex, said that about two years ago, the complex’s management board required all households in the building to buy fire insurance – which was actually mandatory following Government’s Decree No 130 back in 2006. The fire insurance premium stands at 1.4 per cent of the apartment’s total value, including other possessions, according to Ministry of Finance’s Circular No 220 (2010). In addition, the dwellers have signed an ‘undertaking letter’ – issued by the Department of Fire Protection – agreeing to fulfill a number of obligations regarding fire safety. This practice is becoming commonplace throughout the country. Xuyên also mentioned that the management board organised a fire drill once a year, with the participation of fire safety department’s officials. Different scenarios are set out and selected occupants practice evacuation in a calm and orderly fashion. Talks with fire safety officials are also held to raise awareness of the occupants, she said. Experts have said that since residents of old apartment buildings may find it difficult to install modern fire protection system, measures like fire insurance, regular fire drills and safety talks should no longer be just recommendations, but a legal requirement. With the holiday season just around the corner, local fire protection departments will work in close collaboration with relevant agencies to inspect manufacturers and service venues at elevated risks of fire and other important locations of political and social importance, said Lieutenant Colonel Việt. “Any business or individual found to be deliberately violating the regulations will be subject to sanctions of different degrees, from administrative fines, to temporary suspension, even criminal prosecution, without exception,” Việt warned. Encouragingly, besides the conventional and formal education materials and training programmes, more watchable and readily ‘digestible’ contents have been prepared – in the forms of short clips and illustrated pamphlets – and distributed to the media to publish, informing the public about fire safety habits and fire emergency procedures, he said. Some seemingly harmless habits can lead to disasters in the upcoming Tết (Lunar New Year) celebration. Incense burning is a long-standing tradition. The altar is usually made of wood and holds numerous other inflammable materials like candles, joss papers, etc. It’s recommended to avoid letting incense sticks burn through the night, or burn too many sticks at once. It is also good to place a bucket of water and/or sand nearby, just in case. Firearms and explosives are categorically banned, as are exploding firecrackers. While the occasion involves a lot of feasting, it becomes even more important to check cooking appliances twice for possible malfunctions, especially gas cookers. The same examination must be extended to other electronic appliances in the house – lighting systems, TV, sound system, etc. Firefighters recommend turning these appliances off if occupants go on a trip.